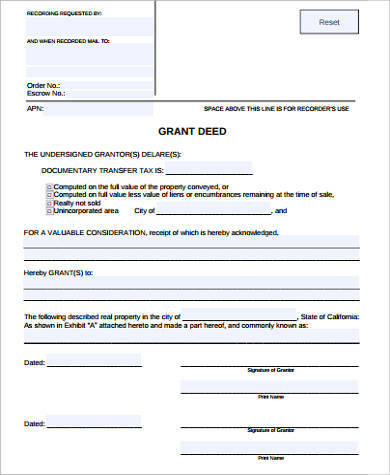 A grant deed is a legal document that transfers a real property title or interest from one person who is usually called the grantor to another person otherwise known as the grantee. The document must describe the property through a legal description of boundaries and parcel numbers and must be signed by all concerned and acknowledged by a notary public. 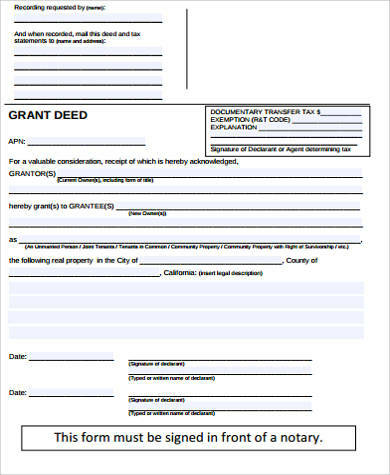 Our Sample Forms for grant deeds come with a variety of examples that users can refer to, and these can all be edited or modified and can be downloaded in both Word Doc and PDF file formats for printing. 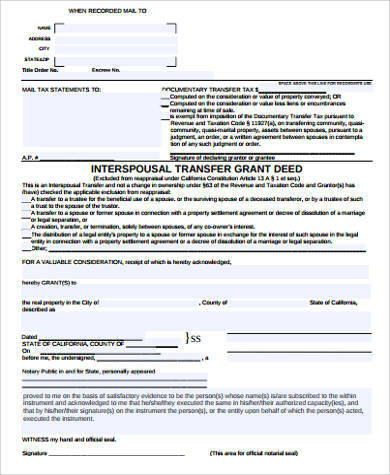 When a grantor issues the grant deed, the transfer of the title can only be finalized through proper recording by the register of deeds. 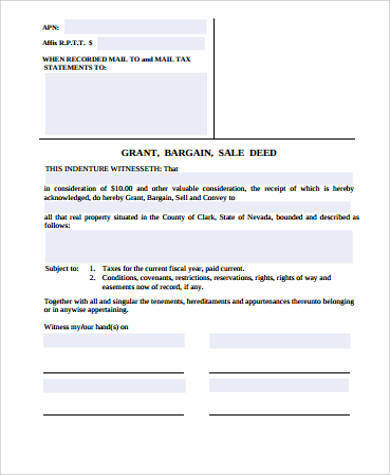 The grant deed document is also proof that the grantor is actually the owner of the property or interest and owns the title to transfer the said property or interest. The notary public’s role meanwhile is to make sure that the grant deed is properly signed and acknowledged before placing the seal and marks to certify the document is genuine. This is done to prevent legal documents from being forged. 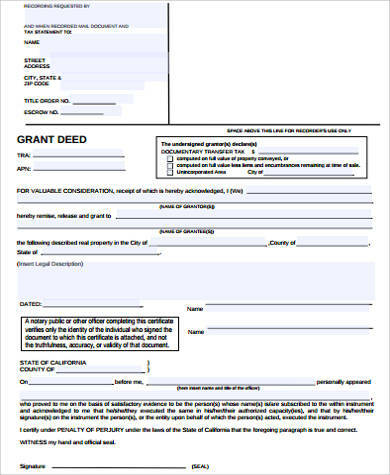 By notarizing the grant deed, the document means that the signature of the grantor is totally genuine and the grant deed is not bogus. that the property is not under any lien or counterclaim or any other restrictions that have not been disclosed to the buyer (grantor). There have been cases when properties have third-party claimants or taxes have been owed by the seller on the property. It was found out too late by the buyers and legal complications arose out of the bought property. That’s why it’s very important that the property should be thoroughly scrutinized before a grant deed is issued and notarized. 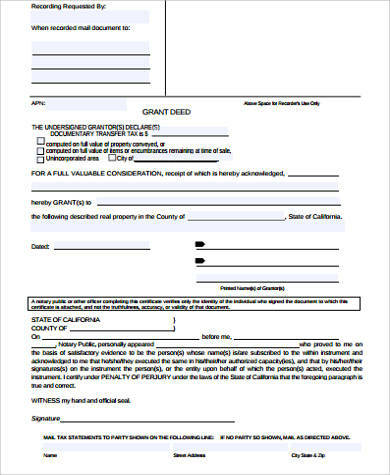 For those looking for a legal document to transfer interest of property or other cases, our website offers Sample Quit Claim Deed Forms. These are useful for when a buyer needs to issue a formal renunciation of any interest on the property being sold and also for several cases for insurance purposes. 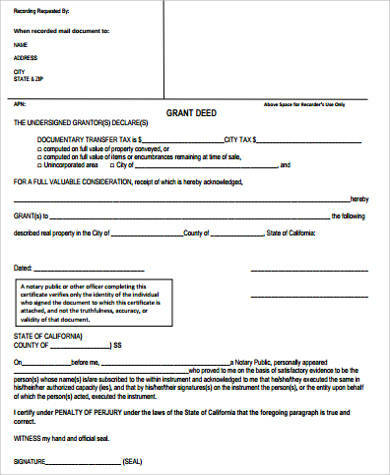 There are some jurisdictions that allow the issuance of a warranty deed in place of the grant deed. This is to ensure that the grantor or seller will defend the title against any other claimants to the property. For properties that are divided into several sections, the deed poll is often used instead of the grant deed. This can be useful when there are several persons who need to act jointly to express intention on the division of a property. However, a deed poll may not be considered a contract since it can bind only one party who express intention but not a guarantee. This may only be useful when siblings need to divide a property among themselves. For those who need a copy of warranty deeds, our Sample Warranty Deed Forms are also available for downloading and printing. These have several examples that users can refer to and may be downloaded in both Word Doc and PDF file formats.